Welcome to our website - Sail Indonesia is an annual yacht rally that has run every year since 2001 and 2019 will be our eighteenth year. For Sail Indonesia 2019, we will depart from Darwin on July 27 and this will be the beginning of a three month program of linked events across Indonesia. These events will be supported by the Indonesian Ministry of Tourism as well as the Local Government Centers at the destinations you will visit as you cross the country. This web site is to promote Indonesian Marine Tourism, co-ordinate and manage our rally. 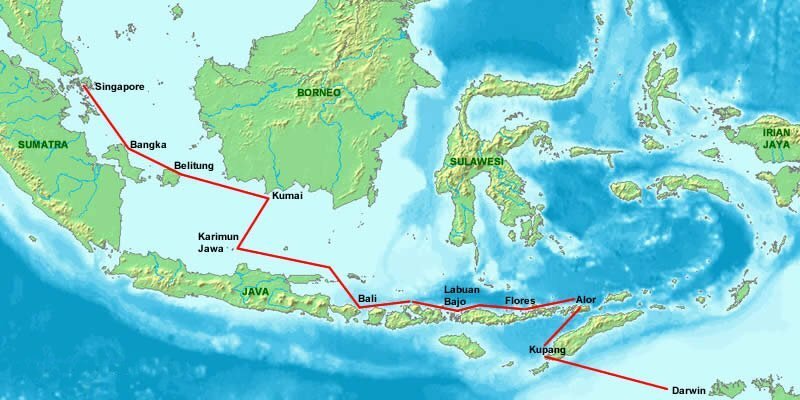 More than 1200 yachts have joined our rally across Indonesia during the past seventeen years, please see our Stories page where you will find links to many yacht web sites, blogs, guides, diaries and accounts written by some of our participants from these years. From the first rally in 2001 our mission has always been to raise awareness of Indonesia as a Marine Tourism Destination and to promote Indonesia as a cruising area for yachts and to introduce sailors to some of the most historic, exciting and interesting sailing destinations across Indonesia and in fact anywhere in the world. When you join our rally you will benefit from our experience of over 20 years introducing yachts to Indonesia with up to date and accurate information to ensure your visit is trouble free and most importantly enjoyable. You will receive assistance with all formalites before you leave for indonesia and most importantly as you cross the country. During the three months following your arrival in Kupang you can just take it easy and day sail west along the north coast of Flores and participate in a series of linked Events and Cultural Festivals at the different stopovers across the country on the islands of Timor, Banda, Lembata, Wakatobi, Flores, Sulawesi, Bali, Java, Borneo, Belitung and finally on to Batam or Bintan just south of Singapore. Under the managemant of the Indonesian Sail Tourism Association ASWINDO led by Dr Aji Sularso you will be able to experience different peoples and their cultures, different lifestyles, different arts, different crafts, wonderful foods and of course different languages. You are welcome to participate in all events and stopovers after your first port of entry in Kupang, as the Indonesia Organising Committee at each port will provide you with hospitality, reception and festivities. You do not have to participate in all the events on our rally as there will simply not be enough time. After you arrive in your first port you can then join the events that suit your schedule. You will be able to see some of the more remote, interesting and less developed parts of Indonesia as you cross the country often away from the well worn tourist areas. Singapore is a wonderful stopover, ideal for all services, transfers and a break, after your long voyage across Indonesia. Singapore is home to Raffles Marina, a full-fledged country club, offering a first class range of all facilities and services. Located at the west end of Singapore, away from the hustle and bustle of city, you can immerse yourself in our unique nautical surroundings. Raffles Marina provides easy access to Singapore’s best sailing and cruising waters, a full service boat repair yard and dry stack storage for powered boats. Protected by a solid breakwater, it offers the comfort of a safe and calm stay. Shore power services, freshwater supply and Wireless Internet are also available around the clock. Sea view sunsets, alfresco dining or taking a dip in the landscaped tropical pool are just a few of the treats in store for visitors. Raffles Marina welcomes you! Sail Malaysia - Sail Indonesia works in partnership with Sail Malaysia and after our Sail Indonesia program across Indonesia ends at the end of October you can then take some time out and sail on to Singapore and Malaysia. Sail Malaysia begins from Putri Harbour Marina, Johor Baru located just north of Singapore and sails up the west coast of Malaysia again in a series of linked events finishing at the island of Langkawi in the second week of December. There will be an additional entry fee for the Sail Malaysia event and again you are able to make your own way up the coast of Malaysia and participate in the stopovers that suits you schedule. Please Note - All care has been taken in the preparation of this web site, it contains the best information available to us at any time. However in Indonesia the situation and regulations often change without notice and there are often local variations of Central Government regulations. We do our best to keep informed of the latest information and continually update our web site with any changes - so please understand for these reasons that are beyond our control Sail Indonesia cannot guarantee the accuracy of any information mentioned on our web site.